In the age of the side-hustle, branding is everything. 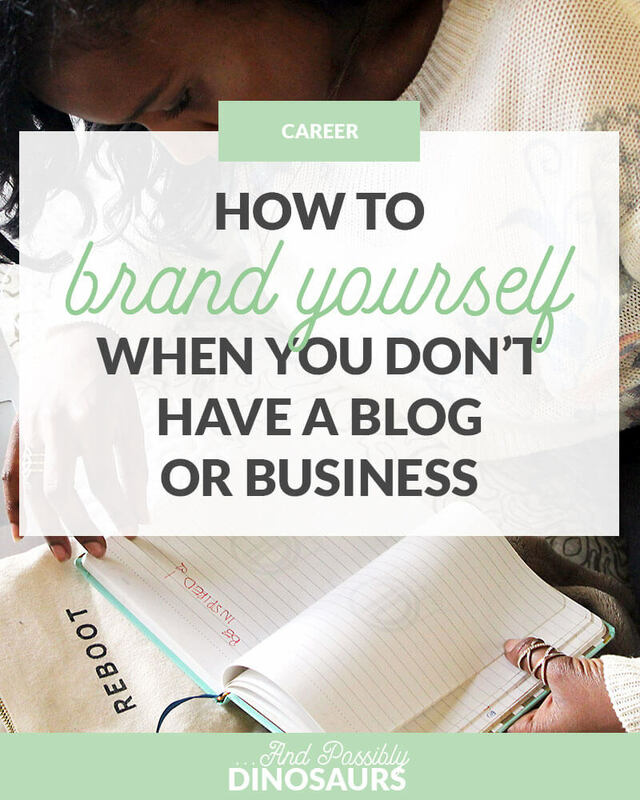 But even if you aren’t rocking a side-hustle, it’s imperative that you know how to brand yourself. After all, a brand is what distinguishes a company, product, service, or person from another. As you’re applying for jobs and meeting people, having a brand will set you apart and make you that much easier to remember. Ready to start your own personal branding journey? Let’s go! 1 | Decide on your personal brand. First, let’s decide what you want your personal brand to actually look like. I’m not talking visually here—how do you want someone to feel when they talk to you? What’s the first word that comes to mind when you think of yourself? Is it strong? Shy? Weak? Anxious? Happy? Keep that word in mind. Now, what do you want that word to be? Encouraging? Relaxed? Strong? If you’re lucky, those two words are the same. If you’re like 95% of the population, you’ve got some work to do! And that’s 100% okay—I do, too! My word is empowering. I want to make it easy for people to achieve their dreams. Whether I teach them a new skill or give them a quick confidence boost, I want to empower others. I know I’m not there yet, and that’s okay! As long as I’m working to get closer to it every day. 2 | Determine how to brand yourself in your day-to-day life. Now that we have a destination for your personal brand (that is, your new word), it’s time to start implementing. Don’t whip out your markers and start creating a new design just yet! It’s so tempting and fun, I know. But first we have to make sure it’s really true to who you are. Before every interaction you have, think of your one word. I, for example, will check in with myself before every meeting I have. I’ll take a deep breath, clothes my eyes, and remind myself to be empowering. I’m naturally hesitant toward change, so this is hard for me! If someone asks me to help them with a project, my gut reaction is to tell them no. And that’s not always bad! What is bad is saying no before I’ve actually considered whether or not I can help. If you’re having a hard time aligning your everyday actions with your new brand, you’ve got two paths you can take. The first is to accept that change is hard. But if this is really the person you want to be, then do it! It’s going to take some time (probably more time than you’d like), but it will be worth it in the end. Conversely, you can accept that this ideal doesn’t mesh with your personality. If your word is to be sociable, but your ideal day is sitting at home with your pets reading a good book, then maybe your brand isn’t right for you. You’re not trying to change who you intrinsically are, here. You’re just trying to bring out your best, most favorite qualities. So if that’s not working, it might be time to go back to step one and reestablish how to brand yourself. Keep practicing every day, every time you interact with someone until your brand starts becoming easier and easier to live out. Because branding isn’t just online and in print; it’s your everyday interactions. 3 | Keep your branding in mind as you post on social media. Interactions don’t just happen in person or via text message. They happen every day on social media. But here’s the thing about social: you’re interacting on a much larger scale than you are in the office or at the bar. That’s why it’s so important for you to keep your brand in mind every single time you post to social media. Since my word is empowering, I never take to social media to slam someone’s idea or make them feel bad for asking a question. You won’t see me answering a question with “I don’t know how you haven’t figured this out yet.” Because that’s basically the farthest thing from empowering I could ever say. So we’re not just talking imagery, here. Remember: we haven’t gotten to your visual brand just yet. Before you post a single thing to social media, whether it’s a news article, a photo, a comment, or a video, ask yourself: does your post match your personal branding? 4 | Create a visual identity for your professional materials. Finally, the fun part! Now that you’re pretty comfortable with your brand and you’re living it out with every interaction, it’s time to create a visual identity for your professional materials. In this case, you’ll want to think colors, fonts, photos, patterns, etc. Peruse Pinterest and see what types of imagery remind you of your word. If your word is lively, for example, you’ll want bright colors and lots of contrast. Conversely, if your word is comforting, you’ll want softer, lighter colors. Try to restrict yourself to 3-4 colors and 2 fonts. For those with little design experience, it’s easier to create a cohesive brand when you’ve got fewer choices to pick from. Once you’ve picked out your brand elements, play around with a few photo editing apps (I’m partial to A Color Story) and pick out some filters that enable your photos to match your visual identity. For example, my Instagram features soft colors that all have a slightly pink or purple tint to them, which matches my blog’s branding. Play around to see what works best for you! Your visual identity should be reflected in all of your professional materials: every public social media channel (especially LinkedIn), your resume, your online portfolio, etc. Without a blog or business, it can seem hard (or pointless!) to brand yourself. But with the nature of the internet, it’s more imperative now than ever to create a strong brand for yourself when networking and applying to jobs. But as long as you have a plan, it’s not as daunting as you may think!